Out of the UK has come a fantastic invention that recently won the 2012 Best New Product (Desk accessory) Award at the UK Stationary Show. The product is easy on the earth and the company is environmentally responsible. So what is it? It’s Imspired. That’s right. 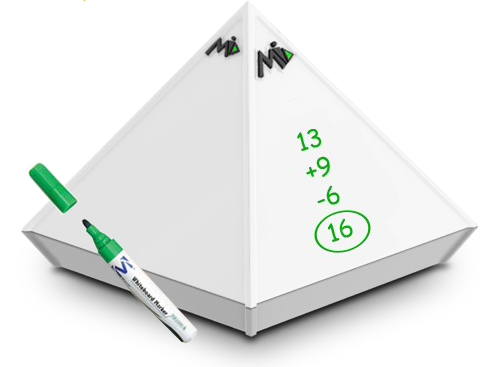 Imspired is a pyramid shaped whiteboard for the desktop or tabletop. Like any whiteboard, you can write messages, doodle and make notes reducing the need for paper and notepads. Less paper, less waste, more trees. Simple. Unlike most whiteboards, this invention has four sides, reducing the amount of desk space it takes up, while also allowing for separate thoughts to be contained on a specific side. The top of the pyramid features a rubber logo that makes picking up the pyramid a cinch. The logo can be customized as can the surface of the pyramid for corporate needs or even personal gifts. The inside is hollow with the exception of a crossbar that allows picking up from the inside if needed. The base is a separate unit with a no-slide rubber underside that offers storage of the pen that comes with the product (eraser included on the end of the pen) or paperclips or other small items. 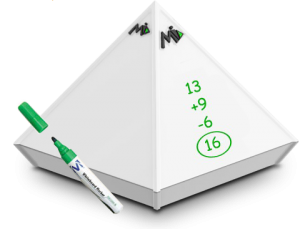 Each of the four sides of the pyramid has an edging strip to ensure a gap between the writing surface and any outside surface, protecting notes from being smudged if dropped. This product is perfect for offices, hotels, schools, banks and homes. Dimensions are 12.5 cm wide and 12.5 cm long x 13 cm tall. Although currently only available in the UK, products can be shipped to the US until distribution begins here. The cost is £16.50. This is money well spent, as Imspired is a corporate sponsor of the World Land Trust, a rainforest conservation organization whose patrons are Sir David Attenborough OM CH FRS and David Gower OBE. Imspired donates £100.00 per month but will increase this to a percentage of the profits as it progresses. So if you have a desk and you take notes, take note of this product. We’re impressed and wish Imspired continued success.